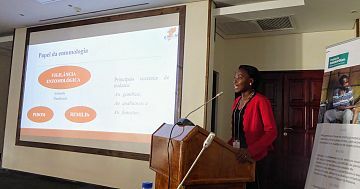 Malaria Consortium convened a successful two-day symposium on malaria surveillance in Maputo, Mozambique this week, in collaboration with the National Malaria Control Programme. The symposium brought together major stakeholders seeking to advance malaria surveillance and elimination in the country. Despite recent reductions in morbidity and mortality, Mozambique still has one of the highest malaria burdens in the Southern Africa region. Malaria control and elimination is particularly complex in Mozambique owing to the varied transmission dynamics and endemicity across the territory, requiring tailored packages of interventions for different areas. The current surveillance system in the country is suboptimal and requires strengthening in order to facilitate the collection of timely and quality eco-epidemiological data, which can then inform the deployment of specific interventions. The symposium aimed to define concrete actions to address bottlenecks in the national malaria surveillance system, and support the collaborative development of a Data-to-Action (D2A) framework. The agreed actions and framework will guide all partners and implementers as they seek to improve their decision-making across malaria transmission strata in Mozambique. Participants in the symposium included Mariana Da Silva, representing the Mozambique National Malaria Control Programme, who thanked all participants and outlined that “there is a real need to improve on partners’ coordination to maximise synergies and effective use of resources to control and eliminate malaria in Mozambique”. The symposium creates a strong foundation for collaboration between key partners as they seek to strengthen the malaria surveillance system in Mozambique. These partners comprise a wide array of stakeholders and technical experts in malaria surveillance, control and elimination, including: representatives from key Ministry of Health programmes, the National Institute of Health, the Clinton Health Access Initiative, the Centro de Investigaçaõ em Saúde de Manhiça, the President’s Malaria Initiative, the Bill and Melinda Gates Foundation, the World Health Organisation Global Malaria Programme, and local implementing partners. The event forms part of the “Moving towards malaria elimination by strengthening surveillance in Mozambique” project, implemented by Malaria Consortium, in partnership with the Mozambique Ministry of Health, Clinton Health Access Initiative, Centro de Investigaçaõ em Saúde de Manhiça, and the World Health Organisation, with support from the Bill & Melinda Gates Foundation. Malaria Consortium has identified the need for a ‘data revolution’ in Africa as a key response to stalling progress in the fight against malaria as highlighted in the 2017 World Malaria Report.